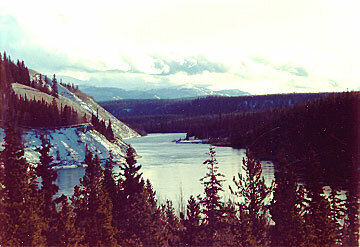 It's interesting that many people are surprised when you tell them the "Mighty Yukon River" flows West by North West. I guess because most rivers in the heavier populated areas of North America flow South. The Yukon River starts just South of Whitehorse and flows 3185 kilometers (1979 miles) before it empties into the Bering Sea. And an interesting tidbit... there's only 4 bridges crossing the entire river (as of 1996).